Government jobs in India for Tehsildar & Naib Tehsildar Posts. HARYANA GOVERNMENT is looking to filling up the vacancies in the Revenue & Disaster Management, Department. Haryana intends to fill up the vacant posts of direct quota of Tehsildars and Naib Tehsildars through re-employment of the retired personnel viz. Naib Tehsildars, Tehsildars and District Revenue Officers. The application form and terms & conditions can be downloaded from the website of Revenue & Disaster Management Department i.e. www.revenueharyana.gov.in. · Degree or its equivalent of a recognized university and should have passed matriculation or its equivalent examination with Hindi/Sanskrit.  A Naib Tehsildar, Tehsildar or District Revenue Officer who is in service can apply two months prior to attaining the age of superannuation.  Satisfactory work performance during service i.e. no pending charge sheet under Rule-7 of relevant Punishment & Appeal Rules of the State or infliction of major penalty, 70 % of A.C.R good and no framing of criminal charges/conviction by any Court involving moral turpitude.  He should be medically fit based on report from the concerned Medical Authority.  Revenue Department will devise appropriate proforma for monitoring the performance of re-employed Tehsildars and Naib Tehsildars after the age of 58 years. For administrative purposes the normal hierarchy of the Revenue Department/District Administration will continue to work as such. The performance of Tehsildars and Naib Tehsildars shall be appraised by the officers in the same hierarchy as is being done in case of regular staff.  The re-employment shall be initially for a period of one year which may be extended by another year. The re-employment period can be extended on yearly basis subject to maximum of two years, depending upon the administrative need and subject to satisfactory performance.  The candidate shall have to give two months prior notice in case he wishes to terminate the re-employment.  The re-employment can be terminated at any time by the competent authority without any notice or reason.  The re-employed person shall be paid as prescribed in chapter XI of Haryana Civil Services (Pay) Rules, 2016. Vacancies: Not Mentioned in the Publication. Process for Applying: The desirous & eligible candidates shall report for walk-in interview on 05.03.2019 at 11.00 a.m. in the office of Secretary, to Govt. Haryana, Revenue & Disaster Management Department, Room No. 205, 2nd Floor, New Haryana Secretariat Building, Sector 17, Chandigarh along with their application form having detailed bio-data about service & experience, affixing two passport-size photograph with proof of educational qualifications, date of birth and their self-attested photocopies. Note:- All the eligible candidates whose application for previous re-employment recruitment was received in the department after due date will have to apply again for walk-in interview with fresh application. 5TH March 2019 is the Walk-In-Interview Date. Government jobs for TGT posts under SSA recruitment process 2019. 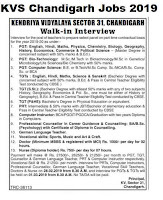 Here comes the new SSA Vacancy for TGT posts in Chandigarh city under various schools. 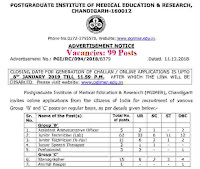 Samagra Shiksha, Chandigarh invites online applications from eligible candidates to fill up 196 posts of Trained Graduate Teachers (TGTs) on contractual basis as per following details at fixed remuneration of Rs. 45756/- as revised from time to time by the society. More information related to this SSA Recruitment 2019 is given below in this job posting. Education Criteria – (Master Degree in concerned subject with 50% marks & B.Ed.). Education Criteria: M.Sc./M.Tech in Biotechnology/M.Sc in Genetics/ Microbiology/Life Sciences/Bio Chemistry with 50% marks. Education Criteria: B.E. or B.Tech/M.Sc Comp. Sc./MCA/B.Sc. Comp. Sc. or BCA. 4. TGTs : English, Hindi, Maths, Science & Sanskrit. Education Criteria: Bachelor Degree with concerned subject with 50% marks, B.Ed. & Pass in Central Teacher Eligibility Test conducted by CBSE ). Education Criteria: Bachelor Degree with atleast 50% marks with any of two subjects History, Geography, Economics & Pol. Sc., one must be either of History or Geography), B.Ed. & Pass in Central Teacher Eligibility Test conducted by CBSE. 6. TGT (P&HE): Bachelor's Degree in Physical Education or equivalent. 7. PRT: Intermediate & 50% marks with JBT/Bachelor of elementary education & Pass in Central Teacher Eligibility Test conducted by CBSE. 8. Computer Instructor: BCA/PGDIT/PGDCA/Graduation with two years Diploma in Computers. 9. Professional Counsellor in Career Guidance & Counselling: BA/B.Sc. (Psychology) with Certificate of Diploma in Counselling. 11. Vocational skills: Sports, Music and Art & Craft. 12. Doctor (Minimum MBBS & registered with MCI) Rs. 1000/- per day for 02 hours. 13. Nurse (Diploma holder) Rs. 750/- per day for 07 hours. Payment will make @ Rs. 27500/-, 26250/- & 21250/- per month to PGT, TGT, Counsellor & German Language Teacher, PRT & Computer Instructor respectively. Vocational Skill Teacher @ Rs. 21250/- per month. 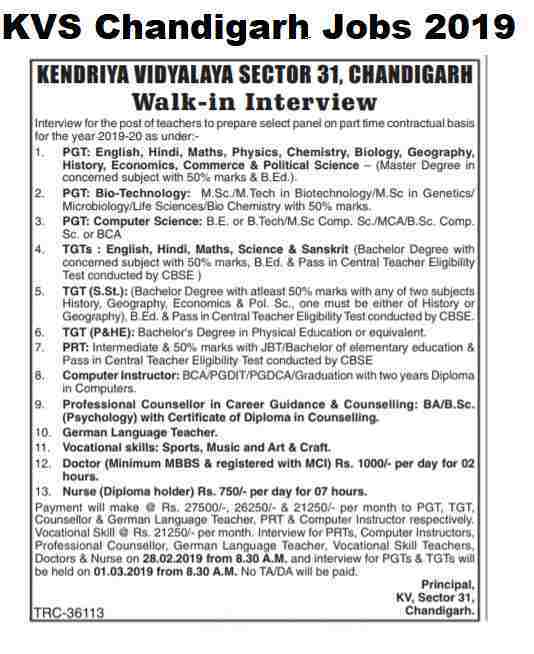 Wak-In- Interview for PRTs, Computer Instructors, Professional Counsellor, German Language Teacher, Vocational Skill Teachers, Doctors & Nurse is on 28.02.2019 from 8.30 A.M.
Walk-in-interview for PGTs & TGTs will be held on 01.03.2019 from 8.30 A.M.
Interview Venue: Kendriya Vidyalaya Sector 31 , CHANDIGARH. 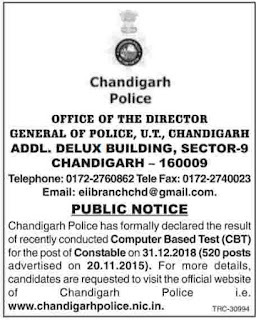 PUBLIC NOTICE Chandigarh Police has formally declared the result of recently conducted Computer Based Test (CBT) for the post of Constable on 31.12.2018 (520 posts advertised on 20.11.2015). 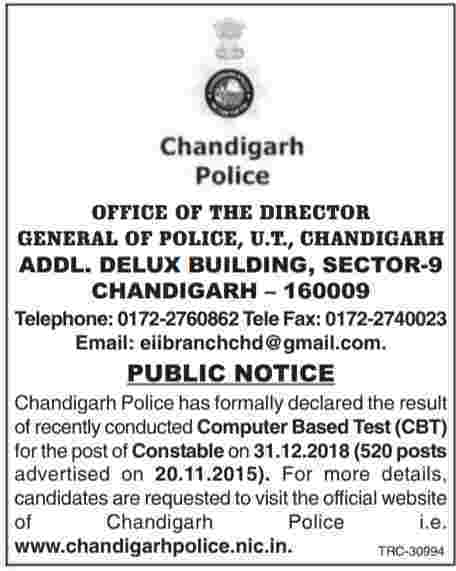 For more details, candidates are requested to visit the official website of Chandigarh Police i.e. www.chandigarhpolice.nic.in. Exam Held on 31st Dec. 2018. Disclaimer: We come to know about this Notification from “The Tribune Newspaper” published on 3rd Jan. 2019, page No.-2. PGIMER Recruitment department is looking to recruit Indian candidates for various vacant positions. There are total 99 vacancies under various job profiles of Technicians, Stenos, Administrative Officers which are going to be filled up through this rec recruitment process. 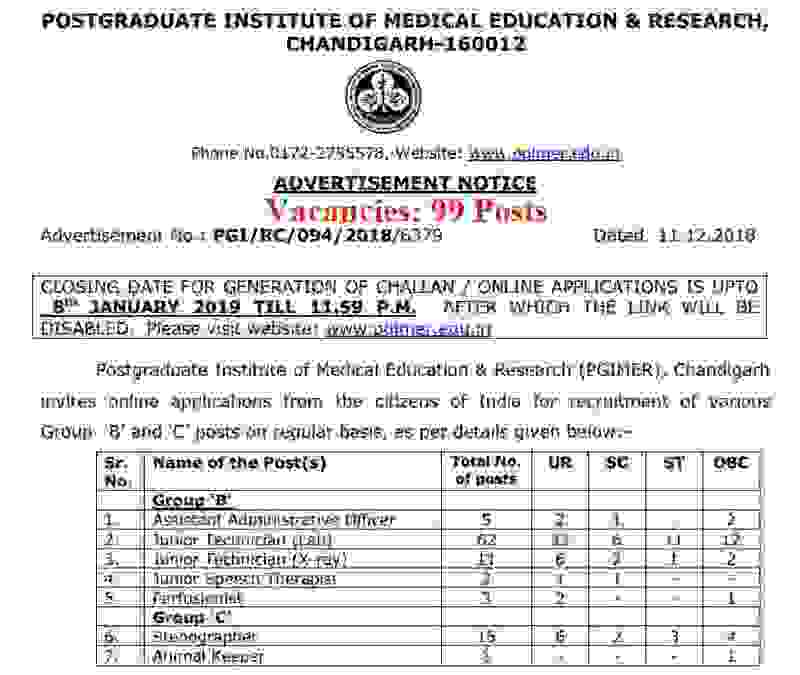 Postgraduate Institute of Medical Education & Research (PGIMER), Chandigarh requests online Government job applications from the peoples of India for the employment of various Group ‘B’ and ‘C’ posts on regular basis, as per details given below in the given article. The applicants ready to apply for this PGIMER Recruitment process 2019 may visit the Institute’s website i.e. www.pgimer.edu.in (Recruitment link at Home Page) for detailed information viz., application/challan form, fee, age limit, pay scale, eligibility, qualification and experience etc. The application form will be available on PGI website from 10.12.2018 to _08.01.2019 (11.59 PM). The number of posts are subject to variation. Read the whole article carefully before applying online for these Government jobs in Chandigarh city. CSIR - Central Scientific Instruments Organisation, Chandigarh, a leading Organization under the Council of Scientific & Industrial Research (CSIR). This organization is involved in multidisciplinary R&D programmes of both basic and applied nature across scientific disciplines with emphasis on measurement science and instrumentation technologies. Government job applications are invited from excited Indian Residents having outstanding academic record and proven scientific achievements along with the requisite experience and a high degree of motivation to take up research as a career in the field of measurement sciences and instrumentation technologies. CSIR is looking to fill up the Government job vacancies of Scientist/Senior Scientist at Chandigarh city. 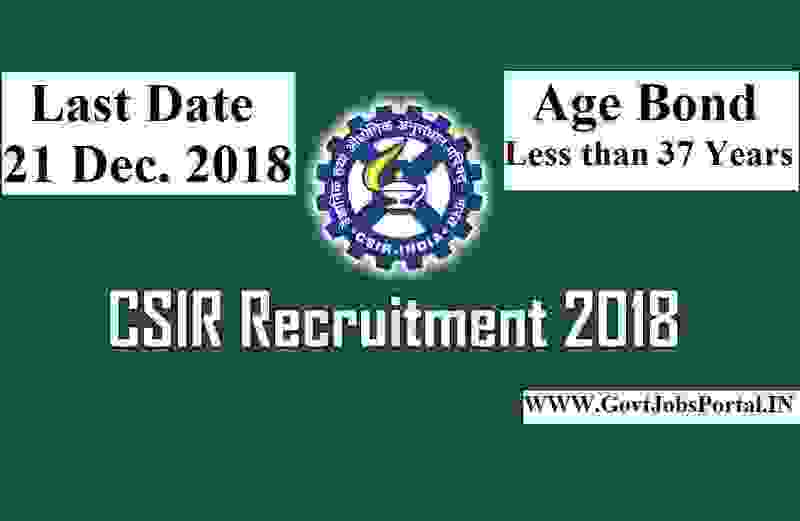 More information related to this CSIR Recruitment 2018 for Scientist posts is given below in this article. Read it carefully before applying online. Age Bond: Must have age less than 32 years for Scientist posts and should be less than 37 years for Sr. Scientist Posts. 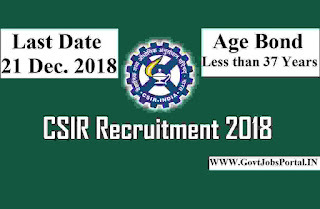 How to apply for this CSIR Recruitment? a. Qualified applicants are required to apply online only through the website of the department, whose link is as follow: http://www.csio.res.in. b. If the applicant does not have a valid email ID, he/she should create a new valid email ID before applying online for this CSIR Recruitment for Scientist posts. c. The online Application for applying these Govt jobs for Scientist posts will be available on the website http://www.csio.res.in from 26th Nov. 2018 to 21st Dec. 2018 upto 5.00 PM. d. Before applying online, the applicants are advised to read the instructions for online application carefully given in this article. e. The non-refundable fee for online application is Rs. 500/- (Rupees Five Hundred Only) for General/OBC candidates. The fee is to be deposited online through State Bank Collect only. The transaction number generated after successful payment of fee is required to be mentioned in the online application. The candidates are advised to download the E-receipt and preserve it. Steps for online fee payment are given in online application form instructions on CSIR-CSIO website. The applicants belonging to the following categories: “SC/ST/PH/Women/CSIR Employees/Abroad Candidates category” are exempted from the submission of application fee. These category candidates can apply without paying application fee. f. Last date for online submission of application form is 21.12.2018 upto 5.00 PM. g. In case of universities/institutes awarding CGPA/SGPA/OGPA grades etc., the candidates are requested to convert the same into percentage based on the formula as per their university/institute rules. h. Successful online application is indicated by the page displayed after clicking Submit Button indicating the generated “APPLICATION FORM NUMBER”. Please note down the same carefully and preserve it. If you do not preserve it, you will not be able to Re-print the Application. i. Candidates applying for more than one post must submit separate online application form for each post along with separate application fee. j. Application once made will not be allowed to be withdrawn and fee once paid will not be refunded on any count nor can it be held in reserve for any other recruitment or selection process. k. Interested candidates are advised to apply in time to avoid last minute rush and it is notified that last date will not be extended on the grounds of online technical issues/problems. 26TH Nov. 2018 is the Opening Date to Apply. 21ST Dec. 2018 is the Last Date to apply. JBT Teacher Vacancies in Chandigarh city for fresher Indian candidates who have completed their education. SSA Chandigarh is looking to recruit fresher Indian candidates for filling up 418 vacant positions of JBT teacher in Chandigarh under Government sector. Those who are looking for the teaching jobs in Chandigarh city, this is the best opportunity to grab a Government jobs in Government sector on contractual basis. 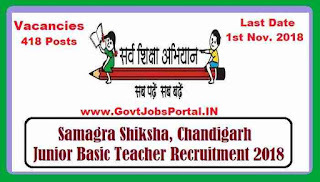 Government jobs RECRUITMENT NOTICE FOR THE POSTS OF JUNIOR BASIC TEACHERS (JBT) Samagra Shiksha, Chandigarh. They are inviting online applications from all Indian qualified applicants to fill up 418 posts of Junior Basic Teachers at the fixed remuneration of Rs. 39422/- as revised from time to time by the society. More information related to these JBT Teacher Jobs in Chandigarh 2018 is given below in this article. So those who are wishing to apply these teaching jobs in Chandigarh have to read this article carefully before moving to online application. The Application fee is non-refundable for applying these JBT Teacher jobs in Chandigarh 2018 . The amount of Rs. 800/-for General Category candidates while Rs. 400 in case of SC candidates will be accepted through online mode/challan up to 29.10.2018 (upto 04:00 PM). Persons with disability are exempted for payment of fee as per instructions issued by Govt. of India.